Bigger is not always better when it comes to data storage. Modern IT professionals are well aware that modern volumes of data are harder to handle than ever. This trend is shaping up to be true for storage managers in charge of massive tape archives. The end result isn’t surprising given that the scale of storage continues to skyrocket in order to keep tape competitive. According to eWeek, 220 TB tape capacity is just around the corner, putting extra pressure on companies to get their tape backup process in order. Thankfully, steps can be taken to prevent the process of managing offline IT assets from spiraling out of control. One of the reasons that managing archives of offline backup tape can get out of hand is that companies lack means of establishing a chain of custody. Employees are likely to treat offline backup tapes with extra care if their handling of the IT asset is being logged and recorded. IT professionals can attempt to institute a chain of custody by using a check-in/check-out log, but such a system could easily be circumvented by a careless or ill-intentioned employee. IT management platforms like AssetAware are capable of generating a chain of custody for every offline storage asset automatically. This approach ensure that employees consider the consequences each time they handle backup tape. 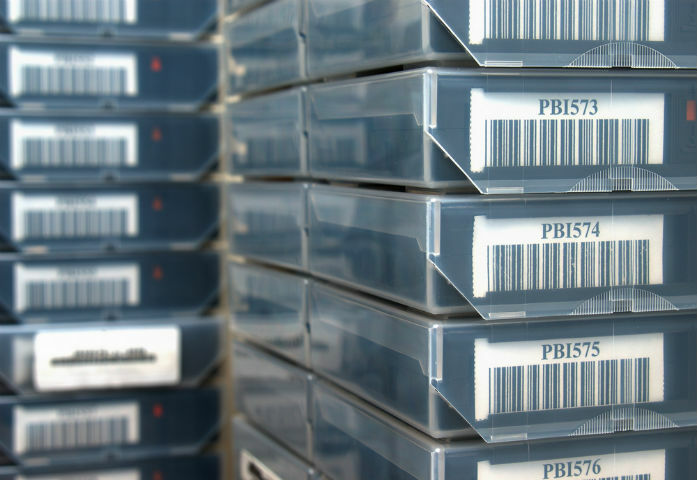 Companies managing multiple backup tape archives face an even larger challenge with regard to keeping operations in order. In cases like these, offline IT asset management platforms become even more essential. These solutions provide businesses with a straightforward means of streamlining asset management workflows across the entire company. This approach will also minimize the chance of a mix-up occurring when offline IT assets are transferred from one location to another. In addition to eliminating costly inefficiencies, these improvements help companies to limit their vulnerability to a compliance audit. A software solution that automatically produces detailed, accurate reports about the status of offline IT assets is a huge advantage in terms of keeping daily compliance concerns to an absolute minimum. IT professionals need a reliable way to locate and identify specific instances of archived data. Without a means of navigation, offline IT assets are more akin to a file dump than a library of relevant information. A robust IT asset management platform can do much to resolve this issue. Better yet, the expanded visibility provided by an asset management solution makes it considerably easier for IT professionals to identify which best practices are effective and which tasks are more counterproductive than profitable. IT professionals can hardly refer to their process for managing offline storage tape as “under control” without a means of confirming when assets were removed. Such a precaution protects companies from theft and greater risks of a security breach in the future. Comprehensive offline storage tape management solutions typically generate certificates of destruction when said tapes are removed from the network. By holding onto these certificates, companies gain physical evidence of compliance and a tool for preventing redundancies in the future.